Celtic to lose out on Landry N’gumeo after failing to meet French club Nancy’s asking price for the player. Celtic fans look to have seen the last of Cameroon star Landry N’Guemo as any chance of a permanent deal being struck for the on-loan midfielder seems dead in the water. Celtic are thought to have bid £1.2million for Cameroon midfield star N'Guemo who is currently on national duty at the World Cup. But with Nancy holding out for £2million-plus and it now looks likely he will move south to the Premiership with Wigan, Stoke and Birmingham all said to be interested in the 24-year-old. 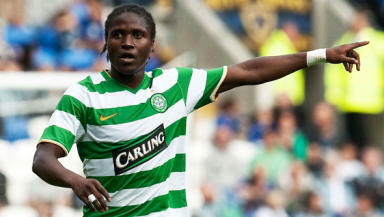 N’Guemo was brought to the club by Tony Mowbray last summer and was a regular for the Hoops this season. After Mowbray’s dismissal he retained his place in the team under interim Neil Lennon. Lennon was said to be keen on retaining the services of the Cameroonian but with the clubs valuation so far apart looks to have lost out on his man. Now the Hoops could be set to turn their attentions to Nguemo's team-mate and fellow defensive midfielder Alfred N'Diaye, who has impressed for the French club since breaking into the first team 18 months ago. Nancysporting director Nicolas Holveck said in the Herald: "We spoke to Celtic at the start of the week regarding N'Guemo and, following that discussion, I now believe he won't be joining them next season. "There is quite a difference in opinion over our valuation of the player and theirs and because there is other interest from England I would expect him to move elsewhere. "We have been having discussions with English sides regarding Landry for more than a week now, but there is no panic over his sale." Holveck revealed there had been talks with Celtic about N'Diaye, who is reportedly valued at £2.5million – more than N'Guemo. "There have been discussions with Celtic over Alfred N'Diaye and there is an interest there in the player," Holveck said. "But there will be absolutely no loan deal struck: it's either a completed transfer or nothing as he is a valuable player. "He will also cost them more than Landry N'Guemo as he is only 20 and already a France (youth) international with vast potential."